A dog was fighting to get out of a pool full of water, but his friends helped him and managed to save him. It made a lot of hairs on the back stand up. 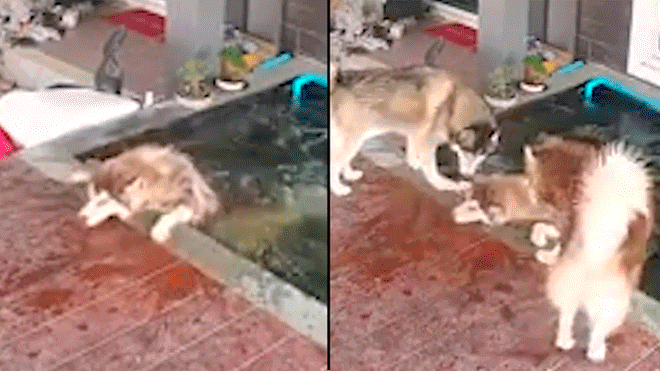 The image shows the moment in which a dog falls into a pool of water located inside a house without being able to leave, until his canine friends help him to be rescued. A two-year-old dog named Selfie was walking along with two other husky dogs, in the house where they lived in Nakhon Pathom, Thailand. It was a common day for the cute dogs, until they decided to leave the terrace where they were. But Selfie, at one point misses and falls into the pond where there were some fish. Your friends are leaving and Selfie is trapped inside. Although it goes to the edge, it does not have a base to lean on to get out of there. He only has his head and his two front legs out fighting to get out. After a few seconds, his friends hear the barking and become concerned, even another smaller than selfie approaches to see what happened. His nervous friends go from one side to the other without knowing how to get him out. It was then that they began to bark. After several minutes of barking, owner Jakkapat Kesaphan, 30, manages to hear the howls and approaches the pond where he sees Selfie without being able to leave. Immediately, he takes him from the legs and pulls him out. The exhausted dog shocked and relieved, thanks to the help of the owner and especially of his friends who did not get tired of barking, it was like they knew Selfie could be saved. People are criticizing the owner who punishes the poor dog by giving him a slap in the head. The action left a lot of controversy because having saved it does not justify hitting the poor animal.